Our curated list of cultural events from around the world. Peru offers one of the world’s most fascinating pantries, wealth that is due to the Peruvian man and an impressive ecological facing the country. Respectful dialogue it had with the Pacha Mama, with its 85 geographic and climatic environments. That was the magic formula to have that variety of products that are now a fundamental part of the global supply. Mistura is organized to show the rich biodiversity and wealth. About 350 producers from all regions of Peru; more than 50 restaurants, 70 trucks and about 16 rustic kitchens, plus regional cuisines and a wider choice of drinks. 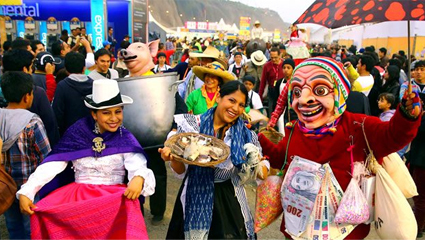 Mistura is held in the first half of the month of September, every year. In addition to products, dishes to enjoy in Mistura contests are held, awards (Best Young Chef, Best Bakery, Best Pastry Young, The Inter-schools, etc.) And the best art and music. Also, it has the presence of a large delegation of international chefs and national and international exhibitors. In 2007, a group of friends met in the north to go for regional food producers and as a bulwark of ‘gastronomic boom’ in Peru. Amid the debate realized they needed to step articulated and beyond discourse. Thus the Peruvian Society of Gastronomy (Apega) was born. In 2008 he organized the first version of the food fair in the former barracks San Martin de Miraflores. That year, the fair was visited by over 30 thousand people what motivated the organizers to work hand in hand with farmers unions. Also this show was well received by the media. Since then, Mistura has become in a few years as the most important food fair in Latin America and continues growing in its international reputation.